Shula's Steak House, named after NFL player and coach Don Shula, is themed after the 1972 Miami Dophins' "Perfect Season". Here you'll dine in an elegant, rich restaurant. The steaks, entrees, side dish and desserts are all generously portioned. Serving only Premium Black Angus Beef you will most certainly enjoy the exquisite menu. The dress code here is business casual. When being seated you'll receive a football with the menu on it. For those who are extremely hungry or feel like trying to be the next Adam Richman, Man vs. Food, then try the 48-ounce Porterhouse. Those who finish it join the 48-Ounce Club with nearly 35,000 other members. 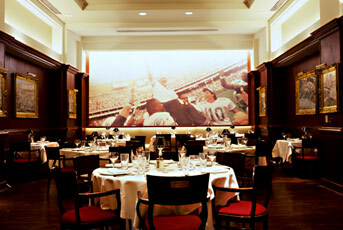 Shula's Steak House has it's own page on the Walt Disney World Swan and Dolphin Resort website.